Beginning Routine in the Gym (Full Body): For the beginning routine, start off with a light weight until you figure out what weight is right for you. For instance, you may start with a 5 pound or 10 pound weight for the exercise. You should be able to do 3 sets of 12 repetitions. By the end of each set number twelve should feel like you cant lift anymore weight. Make sure to rest no more than 60 seconds between each set. If it's super easy to do the 12 reps on the final set, then increase the weight. 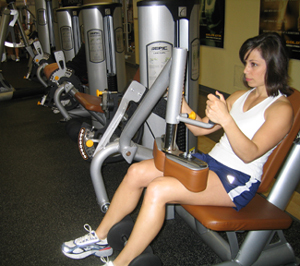 For your abdominal exercises do three sets of fifteen repetitions. TIPS: Place your feet on a platform, making sure your knees, feet and shoulders are all aligned. Bring the platform down to a 90 degree angle, making youre your knees are straight. They should not be going in or out while performing the exercise make sure they are aligned with your hips. TIPS: Relax shoulder, keep elbows close to body, and sit up straight. Bring back bar a little past 90 degrees. TIPS: Bring arms above your head, with your elbows pointing towards the ground. When performing the exercise do not bring down further than a 90 degree angle. 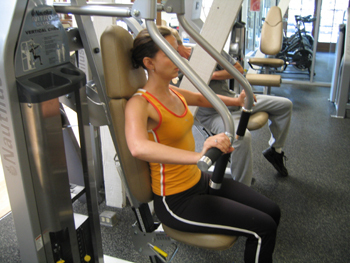 TIPS: Keep opposite arm and leg straight when lifting up to body level.